There may be someone on your holiday gift who has gluten sensitivity or is gluten intolerant (also known as celiac disease). What do you send them for the holidays? Our Gluten Freedom Supreme features naturally gluten free fresh fruit and these delicious gluten free treats: chocolate rugelach and six big gluten free cookies (Chunk of Heaven, Ginger, and Chocolate Chip) by Las Delicias Patisserie and an assortment of gluten free cakes (classic coffee cake, a raspberry crumb cake, and pumpkin muffins) baked in an exclusively gluten free kitchen by Tu-Lu’s Bakery in New York City. We also have a line of Farmhouse Cheese Baskets that feature gluten free crackers. People who are gluten free can enjoy most cheese freely. (The only exception may be cheeses that have mold, such as blue cheese and Roquefort, which our gifts don’t include.) These cheese gifts feature three, four or six handmade raw milk cheeses as well as fresh fruit, a cheese knife, balsamic fig chutney, and gluten free sea salt crackers. Happy snacking for everyone! Another gluten free gift option is our Bagel Brunch with gluten free bagels. Bagel Brunch is the quintessential Jewish-inspired brunch featuring cream cheese, smoked salmon, capers, orange juice, and gluten free bagels made in a dedicated gluten free facility by The Greater Knead. This will put a smile on the face of any gluten free bagel lover! 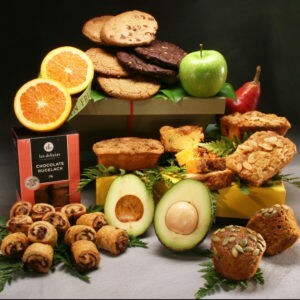 Finally, in addition to gluten free gift baskets, Manhattan Fruitier offers individual gluten free foods: a cookie sampler, our cake assortment, brownies, and rugelach. These make a great smaller gluten free gift or may be combined to create a more substantial gift. The bottom line is that you have plenty of high quality, delicious, beautiful gluten free gift options for the holidays. So don’t hesitate to indulge your gluten free friends and family members!